Hotel Boulevard – “The Happy Hotel” is the story of a Pretoria establishment that grew from a modest boarding house into one of South Africa’s most famous and popular hotels. The book is a tribute to the vision and dedication of the McLachlan brothers, Archie and Jimmy, who built the hotel in 1954 and were the enterprising owners until it closed in 2001. The social and political history of Pretoria and South Africa during the heyday of the hotel is skillfully woven into the narrative. Pretorians will remember with nostalgia the wunderful meals served in the Flamingo and Moulin Rouge restaurants; the special events hosted by the hotel and the theatrical production initiated by the general manager, Arthur Honey. Many will mourn a lost age of elegance. Detailed accounts of the most bizzare liquor laws ever invented, which almost imposed impossible restrictions on hotel managers, prove that truth is strangers than fiction. Humourous anecdotes illustrate the mine-field of regulations that governed the insistence of the government on bilingualism, the introduction of “ladies bars” and barmaids, and the accordance of the hotel of “International” status which allowed black patrons full access to its amenities. Hotel Boulevard – “The Happy Hotel” is an immensely readable and entertaining story complemented by an archive of amusing and fascinating illustrations. It is a commendable tribute to one of Pretoria’s great institutions of the past and to the people who made it so. 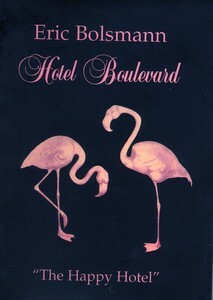 Hotel Boulevard – “The Happy Hotel” was published by Be My Guest Publishers in Pretoria as a 172-page soft-cover edition in 2003.